A quick and healthy snack that the whole family can help prepare and enjoy. Suitable for a snack, picnic or for lunch or dinner with a side serve of veggies or salad. Mix all ingredients in small glass bowl. Cover and refrigerate until serving time. Slice the tempeh into ½ cm thick slices and in a glass bowl combine with the coconut aminos, rice wine vinegar, ½ tsp sesame oil and 2 cloves of minced garlic. Mix well, set aside to marinade for 10 minutes. Once marinated pan fry over medium – heat until golden and brown a slightly crispy, set aside. 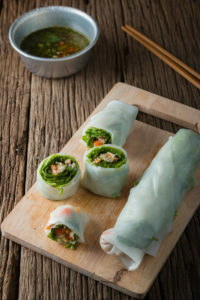 Meanwhile prep your vegetables: Finely shred the cabbage (or use cos lettuce if you would prefer), trim the ends off the snow peas and finely slice them, rinse the bean sprouts and drain well, chop the coriander leaves. Set the vegetables individually aside. Slightly roast the unsalted cashews in a moderate oven or under a grill on a baking tray. Watch the cashews closely, as soon as they start to turn golden remove from heat straight away. Finely chop the cashews and set aside. Place rice-paper wrappers, 2 at a time in bowl of hot water 45 seconds. Remove and place on plate. When completely soft, separate wrappers. Place about 2 tablespoons of tempeh, 1 tablespoon each bean sprouts, cabbage and pea pods, 1 teaspoon coriander and 1/2 teaspoon cashews in centre of each wrapper. Fold one end of wrapper up about 1 inch over filling; fold right and left sides in over folded end. Fold remaining end down, wrapping around roll. Serve with dipping sauce as an appetizer or enjoy as a healthy lunch option.